Join Bondalem Beach Club on a 14-day trip full of excursions and adventure. Professional fitness coaches and choreographers will make your Bali vacation remarkable. Enjoy daily fitness training, excursions to waterfalls, temples, parks, snorkeling, diving, and dolphin watching. Bondalem Beach Club provides comfortable accommodation with all modern facilities; TV, air-conditioner, hot shower, toiletries and hairdryer, bathrobes, and slippers. Luxury beachfront family bungalows can accommodate a family of four. Double rooms of various categories provide comfortable staying for couples. The garden-view villa is located 50 meters from the main territory and offers maximum tranquility. The staff provides the utmost care of all your requirements and wishes. Bondalem Beach Club offers ideal conditions for families with children. There are two swimming pools on the territory, one of which with a shallow section for children, a children's play corner with toys and books, kid's menu in the restaurant, and babysitting services. 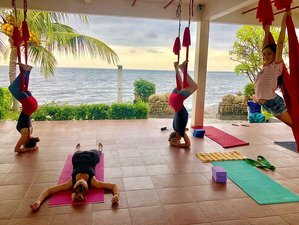 For yoga and fitness classes, there is an equipped yoga hall located right on the seashore. Daily training program usually starts at 6 am with jogging or Nordic walking alongside the streets of Bondalem village. There will be TRX training, pilates, and stretching training before breakfast. On days where you are not doing any excursion tour, there will be swimming or snorkeling before lunchtime. Finally, in the evening, there will be Aerial yoga or dance classes. Bondalem Beach Club does not provide a daily itinerary as all sightseeing tours will be discussed and planned by participants on a daily basis. Bondalem Beach Club is one of the best hotels in north Bali, located on the shores of Bali Sea, surrounded by plantations of coconuts, mango, and papaya. This area is well-known for its natural beauty, black sand beaches, colorful coral reefs, the best Bali waterfalls, and picturesque sceneries. You can also buy fish from the local fishermen and ask to cook it for you or even enjoy cooking it by yourself on the barbecue. Breakfast is included in the accommodation price. Lunch, dinner, fresh fruit juices, and other beverages are available at an extra charge. For lunch and dinner, you can choose from the A la carte menu. Free Balinese coffee, tea, and seasonal fruits are always ready for you at the restaurant. Visit ancient temples and "places of power"
Enjoy famous Balinese massage in one of the beachfront gazebos or in a fully equipped spa. Full body massage, special spa programs with scrubs, and bath with flowers. Bondalem offers a lush, quiet environment underwater, a fast growing coral reef, and infinite varieties of fish. The place is perfect for snorkeling and diving. Bondalem has several dive sites to suit all skills levels from beginner to advanced and boasts enough fascinating marine life for several dives. The depth is 4 - 40 meters. Please do not walk over coral fields during low tide as it harms the underwater world and can also lead to unpleasant injuries. Individual transfer to be provided upon request for 70 USD. If the timing of your arrival is appropriate, a transfer can be combined with a sightseeing tour. Airport: Ngurah Rai International Airport Airport transfer available: Ngurah Rai International Airport (US$70 per person) Additional charges may apply. You can request this in the next step.